Loblaw Companies Limited is a Canadian food retailer that encompasses 1,000 corporate and franchise supermarkets that operates under 22 regional and market segment banners. Loblaw's operates a private label program that includes grocery and household items, clothing, baby products, pharmaceuticals, cellular phones, general merchandise, and financial services. Loblaw brands include President's Choice, No Name, Joe Fresh, T&T, Everyday Living, Exact, Seaquest, Azami, and Teddy's Choice. Loblaw Groceterias Limited, store No. 1, 2923 Dundas St. W., Toronto, Ontario, postcard, ca. 1919. In the early days when I started the cash and carry business, I was told that it could not be done, but my contention was that the people of Toronto and Ontario would welcome the opportunity to carry their groceries home, providing I could offer them higher qualities at a much lower price than they were used to paying. The first Loblaw Groceterias Co. store opened at 2923 Dundas St. W., Toronto, in June 1919. Months later, a second location, at 528 College Street, followed. The ’groceterias’ name was apparently derived from cafeteria - a popular self serve restaurant format. Along with the Loblaw name, the outlets featured big "We Sell For Less" signs across their storefronts. Inside, the stores were clean and well lit, with items neatly displayed and prices clearly marked. While produce and fresh meats were largely excluded from the early stores, sales proved strong. A year later, another Toronto grocer, C.B. Shields, joined with Loblaw and Cork. In addition to being a proponent of self serve, Loblaw was also a firm believer in "the fundamentally sound principle of the chain store system" and its ability to deliver better price and superior quality to through its buying power. Three years after the opening of the first store, there were nine groceterias throughout Toronto. The company had also expanded into the United States with Loblaw Groceterias Inc. outlets in Buffalo, New York. In 1928, with 69 stores throughout Ontario, the company unveiled its new state-of-the-art head office and warehouse at Fleet and Bathurst streets, along today’s Lake Shore Blvd, in Toronto. At a cost of $1.25 million, the Loblaw warehouse was likened to a "temple of commerce" and hailed as a model of efficiency. One newspaper report described it as, "the most modern warehouse building of its kind in the dominion." The warehouse, which served as a distribution centre and manufacturing depot, included an interior loading dock that could simultaneously accommodate eight railway freight cars and 23 large trucks. It featured its own electric tram railway, four giant ovens for baking a ton of cake and half a ton of cookies a day, huge drums for blending tea, 22 thousand feet of ammonia-filled pipes for refrigeration, and a system of pneumatic tubes for sending messages from department to department. A "punched card" tabulating system, forerunner to today's computer, would be installed for tracking inventory as the first of its kind in the Canadian grocery industry. For Loblaw employees, the warehouse included amenities such as bowling lanes and a billiards room, along with an auditorium for putting on plays. That same year, the American company expanded beyond New York State with the opening of outlets in Chicago, Illinois. By October 1929, Loblaw Groceterias' rapid expansion had attracted the attention of competitor Dominion Stores Limited, another Toronto-based food store chain. In a letter to its shareholders, Dominion management put forward a plan to purchase a controlling interest in Loblaw, funded by a preferred share offering. Weeks later, though, stock markets around the world collapsed and the proposed acquisition never took place. In spite of the onset of the Great Depression, Loblaw continued to expand, albeit at a slower pace. By 1930, the chain boasted of 97 "spotlessly clean Groceterias" in Ontario. By 1936, that number had grown to 111, but press reports indicated the company had curtailed further expansion in order to increase the scope of its product offerings at the chain's existing outlets. Meanwhile, the company made a partial retreat from the U.S. market with the sale of its 77 Loblaw Groceterias Inc. stores in Chicago, Illinois, to the Jewel Tea Company. The stores had never shown a profit, although they had largely been turned around by the time of the sale. The company retained its 50 stores in Buffalo, New York, which were profitable operations. In 1933, company co-founder Theodore Pringle Loblaw died suddenly of complications from minor surgery. Eulogized as "the Merchant Prince" by the press, Loblaw was remembered not only for his accomplishments in business but also his religious conviction and personal philanthropy that benefited local charities such as the Kiwanis Boys Clubs of Toronto and the Stevenson Memorial Hospital of his hometown of Alliston, Ontario. After Loblaw's death, co-founder John Milton Cork (1870-1957) took charge of the company. During the early 1930s, Loblaw Groceterias began converting many of its outlets to "Market Stores" that featured full-service meat and produce departments for the first time. Previously excluded because of the chain’s 'self serve' format and the need to cut meats and weigh produce, the new departments proved popular with customers. By 1936, over half of all Ontario locations had been converted to the new format that expanded sales "without a corresponding increase in store overhead." The company also began updating the appearance of its stores to the new, modern, streamlined look. In terms of branding, while the chain often promoted itself as "Loblaw’s" in newspaper ads, it wasn’t until 1939 that the first "Loblaws" signs went up on store facades - replacing the Loblaw Groceterias Co. Limited signage. In addition to the new meat and produce departments, frozen food sections were also featured - a first in Canada. Loblaw also began introducing other modern amenities such as "electronic eye" automatic doors and mechanical ventilation systems for the comfort of shoppers. Store construction, halted during World War II, resumed in the late 1940s as Loblaw undertook a program of "expansion and modernization." Parking lots, a new phenomenon for the chain, became an important design component of the company’s "super markets" in the post-war era. In particular, the Loblaw promoted its new "rear entrance and exit stores," with checkout counters at the back that allowed shoppers, increasingly motorized and suburban, direct access to their cars. Other modernizations included "healthfully-cool refrigerated" air conditioning, introduced by Loblaw in 1949 - the first Canadian grocery chain to do so. In spite of such innovations, the chain still hearkened back to its retail roots with references to the "self-serve" nature of its fruit, vegetable and meat departments. In 1947, a major shift in corporate ownership took place with the purchase of 100,000 Class B shares of Loblaw Groceterias Co. Limited by Canadian industrialist W. Garfield Weston. Weston, president of George Weston Limited, whose interests included baking, grocery wholesaling, and paper manufacturing, acquired the block of voting stock from Loblaw co-founder J. Milton Cork. Although the share purchase did not represent majority control of Loblaw, Weston was able to have his old friend and colleague George C. Metcalf appointed to the board of directors, as well as named vice president and general manager. By 1953, though, Garfield had secured majority control through parent company George Weston Limited and Metcalf was appointed president of Loblaw Groceterias. With Weston in control, a program of rapid expansion, particularly through acquisition, followed as the company extended its holdings beyond Ontario into other regions of Canada and into the United States. In 1953, Loblaw Groceterias acquired majority control of Loblaw Inc., the former American branch of the company with stores in New York State, Pennsylvania, and Ohio, through a purchase of stock from George Weston Limited. That same year, Loblaw also bought the Power Supermarkets chain of Toronto. More noteworthy, though, was its decision to take a 25 percent stake in Chicago-based National Tea Co., a major supermarket chain with some 750 stores in twelve states, three years later. With an ever increasing array of retail assets, Loblaw Companies Limited was incorporated in 1956 as holding company for Loblaw Groceterias and the recently acquired holdings south of the border. That same year, Loblaw also announced a major new thrust into Western Canada with 32 supermarkets slated for construction. Other acquisitions followed, including Atlantic Wholesalers in the Maritimes with its associated retail outlets. At its height, Loblaw Companies Limited would represent the third largest grocery retailer in North America. As large as Loblaw had grown, food retailing remained highly competitive and special promotions and customer loyalty programs were introduced as a way of attracting and retaining consumers. During the 1950s, car giveaways were a popular highlight of many grand openings of new Loblaws supermarkets. In 1959, the company entered the trading stamp wars with its own Lucky Green Stamps. Loblaw president George Metcalf brought store managers together for an early morning meeting in Toronto to make the surprise announcement, informing them that the stamps, redeemable for household gifts, had already been delivered to their stores. While at first quite popular, the program was finally concluded in 1967 as customers increasingly saw trading stamps as an expensive promotion that translated into higher prices at the checkout counter. During the 1960s, while Loblaw set record sales, corporate profits declined. An era of aggressive expansion had paid off in terms of revenue growth but apparently at the expense of profitability. As shareholders complained about a lack of information from the company, frustrated analysts, unsure as to the corporate structure or holdings, became increasingly reluctant to recommend the stock. Loblaw annual meetings were better known for their distribution of cookies, cake and groceries than information on operating performance. While George Metcalf remained head of Loblaw Companies Limited, Chairman W. Garfield Weston began making changes to senior executive ranks, including the appointment of Leon Weinstein, former head and son of the founders of Power Supermarkets, as president of Loblaw Groceterias Co. Limited from 1968 to 1970. Weinstein soon indicated his intent to "stop giving away baskets of groceries at annual shareholder meetings and try to raise dividends." To find out what Loblaws shoppers thought about the chain, Weinstein introduced a questionnaire on his personal letterhead, "asking customers to check-off their complaints," and received 65,000 replies, or three times the number expected. In spite of attempts to get a handle on operational issues, Loblaws was still perceived as an "ailing supermarket chain." Meanwhile, pre-tax profits for Loblaw Companies Limited declined from $45.6 million in 1966 to $18.6 million in 1971, "and then vanished altogether." By the late 1960s, the company had begun selling assets. Between 1968 and 1974, Loblaw sold $164 million in holdings to corporate parent George Weston Limited in an apparent extension of "financial assistance." Yet Loblaw continued to make acquisitions. In 1969, it bought a controlling interest in Sayvette, a money-losing Toronto-based discount department store chain and went on to spend $8.7 million to acquire 100 percent ownership. But as competition heated up, losses mounted and stores were closed. The last Sayvette shut its doors in late 1977. By the early 70s, Loblaw was struggling under the weight of too much debt with millions of dollars of financial obligations coming due over the next few years. At the same time, its stores were badly in need of refurbishing and sales were in virtual free fall. Within a year, the company’s share of the crucial Ontario market had been cut in half as a result of price wars among the major chains. South of the border, things looked somewhat better but only on the surface, with many of the company's supermarkets in large American inner cities in decline. A Canadian royal commission study years later noted "the company’s failure to spend sufficient funds on the refurbishing of its existing supermarkets and the opening of new ones," in addition to a dividend policy that could not be justified on the basis of earnings. Loblaw also found itself constrained by various financial arrangements. In particular, so-called "lease and leaseback" agreements effectively prevented it from closing many of its smaller, money-losing outlets. To make matters worse, senior management was often reluctant or intransigent when it came to making operational changes. Faced with the possible bankruptcy of Loblaws, Garfield Weston asked his youngest son, W. Galen Weston, a successful entrepreneur and retailer in his own right, to take a close look at the chain to see if it could be saved. In February 1972, Galen Weston was appointed Chief Executive Officer of Loblaw Companies Limited. With financing secured through a family holding company that freed Loblaw from its leaseback agreements, Weston began rationalizing operations, shutting down dozens of unprofitable stores while remodelling those that remained. "As a 200 store chain, we didn’t look very good. As a 100 store chain, we looked very good indeed." In addition to dozens of store closures, warehouse operations were consolidated and new distribution centres built. Galen Weston next brought in Toronto designer Don Watt. Known for his innovative product packaging and use of photography, Watt proposed a complete makeover of Loblaw's corporate image and retail space. Although Watt had little experience in supermarket design, Weston gave him the go ahead to remodel one of the stores. Weston reportedly told Watt that, "Loblaws is in such trouble that if it doesn’t work, it doesn’t matter. If it works - good." On a budget of only $30,000, the renovations took place at night so the store could stay open during the day. Along with a complete redesign inside and out, that included new colours and a new repeating 'L' Loblaws logo, Watt made changes to traditional grocery store layout. He doubled the floor space of the produce department and moved it from the back of the store to the front. He also introduced new design elements such moveable bins and huge photo enlargements of fresh fruits, vegetables and meats to graphically convey quality and freshness. Wood panelling covered over old walls and broken mirrors to give the interior a fresh, contemporary feel. Within the first few months of the remodelling, sales increased 60 percent. In spite of all the difficult progress made, Loblaw would still have occasion to make strategic missteps in coming years, as it continued to innovate and attempt to anticipate the demands of the marketplace in a highly retail sector. Since Loblaws introduced its 16 no-name products, it has sold one million units with many repeat purchases. "The suppliers of a number of these products can't keep up with the demand. In several cases, we've sold in two and a half weeks what we originally estimated would be our annual requirements. When one competing food industry executive was critical of Nichol, noting the irony of heavily advertising No Name when generics typically went unadvertised to hold down costs, Nichol pointed out that Loblaw had not increased its promotional budget but simply redirected its advertising dollars towards the new line. A year later, the number of No Name products had increased to a hundred different items and represented five percent of Loblaws sales. Within months of the No Name launch, Loblaw opened a prototype No Frills store in East York. Also known as a 'box store,' since items were not individually shelved but left in their cardboard shipping cartons, usually with the front cut away, the new store advertised "the lowest overall prices in Toronto." Though customers had to pack their own groceries, bring their own bags or pay 3 cent apiece, and contend with a limited selection of only 500 items, shoppers crowded the store on opening day. Customers gave up other standard conveniences, such as full-service meat or dairy departments, since refrigeration units had been removed to cut costs. In spite of the limited selection and minimal service, the first No Frills store proved a success and within months the company converted two more Loblaws locations to the new deep discount format. While the original No Name line-up was promoted as basic, everyday items at considerable savings, Dave Nichol eventually began experimenting with the product line-up by adding more upscale items. Products such as Gourmet Barbecue Sauce, Escargot and imported jams began appearing in the familiar yellow and black generic packaging. When President’s Blend Gourmet Coffee was launched in time for Christmas 1983, it was soon outselling every other grocery item on Loblaws shelves. Nichol concluded that consumers wanted to go up-market and the decision was made to develop an entire line of upscale products under its own private label brand. Modelled on the Marks & Spencer St. Michael in-house brand, and touted as being equal to or better in quality than competing national brands at less money, President’s Choice was personally endorsed by Nichol as president of Loblaw Supermarkets. The introduction of the premium line also coincided with the advent of an advertising flyer entitled "Dave Nichol’s Insider’s Report." Based on a California supermarket flyer called "Trader Joe’s Insider’s Report," and referred to as "a mix of Mad magazine and Consumer Reports, zaniness and food tips, wrapped up in a comic book format," the insert proved popular with Ontario households. The flyer also became an important advertising vehicle for President’s Choice, which it came to exclusively promote. One of Nichol's early product development successes was President’s Choice The Decadent Chocolate Chip Cookie, which took over a year to develop. Nichol and his team insisted on the use of real butter and twice as much chocolate per cookie as the leading national brand. Although The Decadent was sold in only 17 percent of Canadian supermarkets, compared to 98 percent for Nabisco's Chips Ahoy!, "it fast became Canada's best selling cookie." The 1980s also saw further innovation with regards to store formats. In Western Canada, Westfair Foods, a Loblaw subsidiary, unveiled its first superstore in Saskatoon, Saskatchewan, in 1979. Opened under the SuperValu banner, it was later renamed the Real Canadian Superstore. Modelled after the European hypermarket, the "combination store" included a large selection of general merchandise, along with a full supermarket component. Touted as a "one-stop shopping" destination, the new superstore carried some 30,000 SKUs (stock-keeping units), which expanded to 40,000 over the next decade. The new format not only provided economies of scale and permitted lower retail prices, but also meant that management could build stores on its own terms, rather than be dependent on shopping mall construction. In 1985, with nine Real Canadian Superstores across Western Canada, Loblaw tried to duplicate their success in Eastern Canada with the opening of its first combination store at Pickering, Ontario. Eventually, 13 superstores, four times the size of a conventional supermarket with about a third of the space devoted to general merchandise, were opened in Ontario and the Maritimes. Sales, however, lagged. By 1988, with corporate profits almost cut in half, the company downsized eight of the operations, in some cases changing store banners and leasing out the redundant space to other retailers. "Had Loblaw Companies not owned the real estate, the conversion and sub-leasing penalties might have proven prohibitive." President's Choice, the upscale private label at Loblaw's supermarkets, has been a resounding success in the United States - and has fired a rebellion of consumers and retailers against highly advertised, and therefore pricey, national brands. Its products have found their way into more than 1,200 stores in 34 states. The biggest deal is with Wal-Mart, which had $73 billion in sales in 1993. Dave Nichol, the man behind President's Choice, reports that Wal-Mart's volume on Sam's American Choice and Great Value lines, also developed by Loblaw's, was up 300 percent last year. Meantime, though, Wal-Mart had announced what media reports likened to an "invasion of Canada," namely the acquisition of 120 Woolco stores across the country. Though Wal-mart was barred from selling the private-label line developed by Loblaw in Canada, the two retailers eventually parted company as they increasingly became competitors in the Canadian marketplace. In November 1993, it was announced that Dave Nichol, who for the past decade had been so closely associated with President's Choice in terms of promotion and product development, was leaving his senior executive post to become a private label consultant. Initially, both he and Loblaw expressed the desire to continue working together, with Nichol remaining on in the role of PC spokesman. But as Nichol moved forward with plans to develop his own Dave Nichol brand of private label products with Cott Corporation of Toronto, presumably in competition with President's Choice, the relationship deteriorated. Nichol hosted a couple more issues of Dave Nichol's Insider's Report but then vanished from the cover. The November 1994 edition dropped his name to become simply The Insider's Report. While media coverage of the Nichol/Loblaw split had been extensive, it seemingly had little or no negative impact on brand equity. News reports later indicated that Loblaw, post-Nichol,was experiencing stronger-than-ever corporate earnings. Loblaw president Richard Currie laughs at the notion that Canada has too many grocery stores. There's a lot of floor space, he allows, but never enough in the large, modern, well-equipped, one-stop shopping supermarkets that some Canadians like. Loblaw keeps expanding its fleet of 900 stores, adding about 10 percent to its floor space and sales each year, while increasing its profit margin. 1998 also saw Loblaw become the first Canadian food retailer to extend its product mix into the realm of banking with the launch of President's Choice Financial. Promoted as a very basic no-hassle, no-fee form of personal banking, conveniently located where you do your grocery shopping, PC Financial kiosks and automatic tellers began springing-up in supermarkets across the country. While Loblaw provided the branding, the service-end was made possible through a partnership with the Canadian Imperial Bank of Commerce. Loblaw also promised a new loyalty program that would allow customers to redeem 'points' for free groceries - which later became "PC Points." Within a year, Loblaw would have more than a hundred President's Choice Financial kiosks and bank machines. After almost 25 years at the helm of Loblaw Companies Limited, Richard J. Currie retired as company president in November 2000. John Lederer, a veteran Loblaw executive, took over the top job. As president, Lederer moved forward with a number of strategic initiatives. Administrative functions were consolidated as a new corporate headquarters was unveiled in Brampton, Ontario. Warehouse operations were streamlined with the opening of new distribution centres as the company updated facilities and information technology. And, once again, Loblaw made an effort to offer more general merchandise in its stores in the hope of becoming more of a 'one-stop' shopping destination for consumers – all moves presumably designed to combat the threat posed by a "looming Wal-Mart incursion" as the retail giant announced the opening of more Supercentres in Canada. But as supply chain problems took root, customers began to complain of empty Loblaw shelves and out-of-stock items, while suppliers expressed their frustration coordinating deliveries to distribution centres. Unsold general merchandise began piling up in warehouses. Meantime, key staff, such as company buyers, had quit rather than relocate to the new corporate headquarters. Loblaw began losing money, quarter after quarter, and by the end of fiscal 2005 the company had recorded its first year-end loss in almost twenty years. In September 2006, John Lederer resigned as president of Loblaw Companies Limited and W. Galen Weston stepped down as chairman of the board. Weston's son, Galen G. Weston, was appointed executive chairman, while former Canadian Tire retail head Mark Foote became president and Allan Leighton, a prominent UK executive and longtime advisor to the senior Weston, took on the job of deputy chairman. Dalton Philips was later named Loblaw's chief operating officer. Reaction to the management shakeup was mixed, with Richard Currie critical of the move, saying it was unnecessary, while Dave Nichol expressed his personal frustration that it took five quarters of declining earnings before action was finally taken. With the new management team in place, Loblaw completed a 100-day consultation in which senior executives met with store managers and employees to hear their concerns and complaints. Weston subsequently introduced a "simplify, innovate and grow" strategy designed to "fix the basics" by refocusing the company’s attention on food retailing. He also publicly declared that it would take at least three years to turn operations around as the company continued work out kinks in its supply chain and upgrade computer systems. By the end of 2007, Loblaw had returned to profitability. Since the departure of Dave Nichol a decade and a half before, Loblaw had been without a spokesman to pitch its brands and supermarkets. In 2007, in a major shift on the promotional side, executive chairman Galen Weston became the new public face of the company and in particular its in-store private label products. With the 2008 financial crisis and recession, Loblaw began to heavily promote not only President’s Choice but also its generic No Name products as an economical alternative to higher-priced national brands. In a television commercial reminiscent of Nichol from the 1980s, Weston presented two shopping carts, one filled with No Name items and the other with comparable national brands to show how consumers might save on their grocery bills. But while the company continued to struggle with supply chain issues and its partial retreat from general merchandise, one initiative in particular, in the non-food category, was showing considerable promise. In 2006, Loblaw and Canadian fashion designer Joe Mimran teamed up to launch Joe Fresh. Promoted as chic but highly affordable clothing, the new line sold in supermarket and superstore aisles. Joe Fresh sales soon exceeded the company's own projections and Loblaw began expanding into children's wear, shoes, lingerie, beauty and bath products. In 2010, the first standalone store opened in Vancouver and Loblaw announced plans for 20 outlets across Canada. More recently, Loblaw unveiled a number of Joe Fresh permanent and pop-up stores in New York City and surrounding region in what one Loblaw executive described as "very much a pilot project." But Mimran, the former co-founder of Club Monaco, spoke less cautiously, envisioning 800 Joe Fresh stores across the United States within five years, with Asia and Europe the next logical international markets to take the brand. Under Weston, Loblaw refocused its efforts in the area of corporate social responsibility, and in particularly on the environment, in issuing annual CSR reports. A line of more environmentally friendly GREEN products was launched (although many environmentalists and concerned consumers would consider them to be examples of greenwashing). Weston appeared in TV commercials to promote "Canada’s greenest shopping bag," a reusable grocery bag made of 85 percent post-consumer recycled plastic, designed to reduce the number of disposable bags that ended up in landfill sites by a billion a year. Loblaw also unveiled one energy efficient, low emissions environmental flagship store in Scarborough, Ontario, and became the first Canadian supermarket chain to install a wind turbine to supply renewable electricity to one of its stores. In November 2008, Greenpeace alleged that Loblaw was selling 14 out of 15 fish species on that organization's "redlist" of those considered to be the most destructively farmed, and staged protests at some Toronto-area locations. The company denied the allegations, while the accuracy of the redlist itself has been challenged by U.S. government regulators and by the fish industry. Loblaw has since committed to sourcing all of its seafood from sustainable sources by 2013, and now features several Marine Stewardship Council-certified products under its President's Choice product line. Greenpeace's ratings of Loblaw's seafood initiatives have improved over the years and are now above all other national retailers (and second-highest of all retailers ranked), but were still classified as a failing grade in its 2010 report, based on an absence of labelling indicating where or how seafood is fished or farmed, and continued sale of some redlist species. In July 2009, Loblaw extended its presence in the ethnic retail market with its announced purchase of T & T Supermarket Inc., Canada's largest chain of Asian food stores, for some $225 million - $191 million in cash and the rest in preferred shares. Founded in 1993, the 17 store chain, with outlets in British Columbia, Alberta and Ontario, recorded more than half a billion dollars in annual sales. T&T CEO Cindy Lee noted that some of the supermarket's customers already referred to it as the Asian Loblaws. "It goes back to our first successful controlled brand product in a yellow and black package with No Name on it. It wasn’t until six years later that we actually put "No Name" on the packaging," Ian Gordon, vice president at Loblaw Brands Limited, explained. Loblaw has published its own book of recipes. "The Epicurean's Companion" lists an eclectic assortment of dishes prepared using Black Label products including Cheddar Bacon Marmalade Toast and Porcini Glazed Mushrooms with Pancetta. 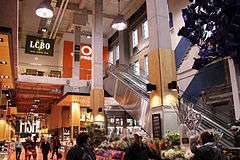 On November 30, 2011, the company's much anticipated urban flagship store, "Loblaws at Maple Leaf Gardens," opened in downtown Toronto. After two years of construction, complicated by the structural challenges associated with turning a 1931 hockey arena into a supermarket, the unveiling of the 85,000 square foot store attracted long lines of first-day customers. Although the conversion of an iconic sports landmark into a grocery store created considerable controversy, the final product met with favourable reviews. The new space preserved many historical and architectural features of the old Gardens, including the spot where centre ice once stood, now found in grocery aisle 25. On display as homage to the former home to the Toronto Maple Leafs is a huge, stylized, blue-metal maple leaf, created from welded-together Gardens seating. Murals and drawings not only honour the Garden's hockey past but also other historic moments, including when Elvis Presley and the Beatles performed live, or Billy Graham preached before the huge venue. Meanwhile, the "food experiences" within Loblaws at Maple Leaf Gardens include "The Amazing Wall of Cheese" which, at 18 feet high, features a 100-pound wheel of Blue Stilton, a "Fresh Food Hall," where customers can order an omelette made from free-range eggs, a "Patisserie," with handcrafted chocolate and fresh baked goods, a sit-down sushi bar and a tea emporium with over 100 types of loose-leaf tea to choose from. Food attractions and historical displays aside, one journalist observed that the space is still very much a grocery store. Loblaw executive chairman Galen Weston, who greeted the first customers through the doors, said that Loblaws at Maple Leafs Gardens "re-imagines the urban supermarket," rather than tries to be a specialty store. The lobby of the store also contains a Joe Fresh and LCBO. Loblaw bought the former home to the Toronto Maple Leafs in 2004 and later partnered with Ryerson University, which built an upstairs ice rink and sports complex, completed in 2012. On July 15, 2013, Loblaw announced that it would acquire Canada's largest pharmacy chain Shoppers Drug Mart for $12.4 billion in a cash and stock deal. Galen G. Weston indicated the possibility for store brands from the two chains to appear in each other's stores following the merger, and that the merger would give Loblaw greater buying power for health and wellness products. The merger received approval by both shareholders and the Competition Bureau, allowing Loblaw to close the deal on March 28, 2014. Shoppers Drug Mart and its administration will continue to work as a separate operating division of Loblaw Companies Limited. There are no planned changes to Shoppers Optimum in favour of PC Plus and PC Points. Loblaw operates under many banners throughout Canada, so as to appeal to different niches but also present the illusion of greater competition. While most of these banners are not likely to be abandoned in the near future, during much of the 2000s the company focused on developing the large-format Real Canadian Superstore banner—which is gradually replacing some Loblaws and Zehrs locations in Ontario—as a national rival to Walmart Canada. Additionally, as part of a 2006 agreement with unionized employees in Ontario, Loblaw announced it would introduce a new food-centred supermarket format originally called the "Great Canadian Food Store" for locations not converted to the Superstore format. This format has since opened under the name "Loblaw Great Food". In total, 44 existing Ontario stores were planned to be converted to either the Superstore or Great Food format between 2006 and 2010, in addition to new construction and existing Superstores. The banners are listed below based primarily on their 2006 format classifications within Loblaw, though some individual locations may not match the specified format. DRUGStore Pharmacy and Loblaw Pharmacy. "Upstairs at (store name)", a community room / cooking school. The cooking school offers kids, adults and teen cooking classes. As well, community room space is available for rent, and completely organized cooking birthday parties are available for children ages 5–16. President's Choice Financial banking services, a points per dollar rewards program operated in association with CIBC. PC Plus, a rewards program designed to give points on online offers through the PC Plus website and in-store offers which are available in stores. The current members of the Board of Directors of Loblaw Companies Limited are: Galen G. Weston (Executive Chairman), Stephen E. Bachand, Paul M. Beeston, Gordon A. M. Currie, Anthony S. Fell, Christiane Germain, Anthony R. Graham, John S. Lacey, Nancy H. O. Lockhart, Thomas C. O'Neil, and John D. Wetmore. 1 2 3 "Loblaw Companies Limited - 2015 Annual Report" (PDF). Retrieved June 19, 2016. ↑ "George Weston Limited - 2015 Annual Report" (PDF). Retrieved November 13, 2016. ↑ Loblaw Companies Limited 2010 annual report. Toronto: Loblaw Companies Limited. 2011. 1 2 ""Dominion buys Loblaw's" - almost a heading in 1929". Canadian Grocer. Toronto. September 1967. ↑ "Loblaw Groceterias Co. Limited advertising supplement". The Globe. Toronto. November 19, 1926. ↑ "A quick history of the supermarket". Groceteria.com. Retrieved 3 April 2013. ↑ Seventy-fifth anniversary = a celebration of Loblaw Companies Limited. Canadian Grocer. 1996. ↑ "Loblaw Groceterias Co. Limited advertisement". Globe. April 29, 1925. ↑ "Loblaw Groceterias Co. Limited ad". Toronto Daily Star. July 20, 1922. 1 2 "Loblaw Groceterias Co. Limited advertisement supplement". Mail and Empire. July 10, 1928. ↑ "Loblaw warehouse finished in February". Toronto Daily Star. January 27, 1928. ↑ "Keeping Tab". The Loblaw News. March 1955. ↑ "Dominion Stores will acquire option to control Loblaw". Globe. Toronto. October 11, 1929. ↑ "Hesitatingly (advertisement)". Evening Telegram. Toronto. July 31, 1930. ↑ "Loblaw Groceterias". Toronto Star. February 6, 1932. ↑ "Last tributes paid to merchant prince who had found God". Globe and Mail. March 22, 1933. ↑ "Active in many lines T.P. Loblaw is dead". Toronto Daily Star. April 3, 1933. ↑ "Loblaw Groceterias Co.". Financial Post. October 31, 1936. ↑ "Loblaw's again makes history (advertisement)". Toronto Star. October 3, 1940. ↑ "World's baking king now Canada's biggest grocer". Toronto Star. October 4, 1937. ↑ "$6.5 million deal in Loblaw shares credited to Weston". Telegram. July 25, 1953. ↑ "George C. Metcalf heads Loblaw's". Globe and Mail. November 5, 1953. ↑ "Loblaw gains control of US food store chain". Globe and Mail. October 9, 1953. ↑ J.K., McKelvey (December 10, 1956). "An investment I like". Globe and Mail. 1 2 "We hate lucky green stamps". Canadian / Star Weekly. Toronto. February 25, 1968. ↑ "Loblaw sales up but profits down". Telegram. December 12, 1968. ↑ Egan, Vincent (November 2, 1966). "Loblaw star, players, setting same but (surprise!) no dividend increase". Globe and Mail. ↑ Goldstein, Paul (June 18, 1968). "Cigar-chomping Weinstein moves to put zest into Loblaw image". Toronto Daily Star. ↑ Frayne, Trent (March 8, 1969). "This rich grocer answers his own phone and at times he may blow his own horn". Toronto Daily Star. 1 2 Alexander Ross (March 1981). "Salvation by surgery". Canadian Business. Toronto. ↑ Bradburn, Jamie. "If You Knew Sayvette a Little Better, You'd Like It a Lot More". Torontoist. Retrieved December 15, 2011. ↑ "The summit meeting that changed course for giant Loblaw". Toronto Star. January 25, 1973. ↑ Armstrong, Julian (May 12, 1978). "Canadians suffer in silence buy less as food prices rise". Toronto Star. ↑ "'No-name' items a success -- Loblaws boss". Toronto Star. April 12, 1978. ↑ Stead, Sylvia (July 6, 1978). "No-Frills supermarket is swamped on first day". Globe and Mail. ↑ Budolowski, Linda (November 1, 1978). "No-name products -- they're here to stay". Ryersonian. ↑ "Don Watt - a 2006 inductee story". Marketing Hall of Legends. Retrieved December 13, 2011. 1 2 Farnsworth, Clyde H. (February 6, 1994). "Quality: High. Price: Low. Big ad budget? Never.". New York Times. Retrieved December 13, 2011. ↑ "Loblaw income plummets". Globe and Mail. Toronto. February 22, 1989. 1 2 "President's Choice is America's Choice". Whig-Standard. February 8, 1994. 1 2 Strauss, Marina (November 19, 1994). "Dave Nichol still haunts Loblaw". Globe and Mail. ↑ Loblaw Companies Limited 1996 annual report. ↑ Francoise, Shalom (December 1, 1998). "Loblaw bags Provigo at last". Gazette. ↑ Deverell, John (July 5, 1998). "Grocers shopping like there's no tomorrow". Toronto Star. ↑ Zlomislic, Erica (16 February 1998). "Loblaw taps CIBC for President's Choice Financial". Strategy: 2. ↑ Partridge, John (February 10, 1998). "Loblaw plans bank reward points". Globe and Mail. ↑ Strauss, Marina (November 10, 2000). "Loblaw picks quiet Lederer as a new leader". Globe and Mail. 1 2 3 Strauss, Marina (January 26, 2007). "Memories of excellence". Globe and Mail. Toronto. Retrieved October 25, 2011. ↑ Shaw, Hollie (June 29, 2007). "Loblaw's new pitchman". National Post. ↑ Hammer, Courtney (January 26, 2009). "Loblaw is playing the no name game, will you?". Retail Marketing Management. Retrieved December 15, 2011. ↑ Shaw, Hollie (23 February 2011). "Joe Fresh Follows Tough Path into Cutthroat NYC Market". Financial Post Business. ↑ "Why Loblaw takes top honours for corporate social responsibility". Globe and Mail. Toronto. June 20, 2010. ↑ "Loblaw modifies select fresh fish and seafood counters to highlight "at risk" fish and suggested alternatives", Loblaw press release, February 4, 2010. Retrieved July 28, 2010. ↑ "Canadian supermarkets move one step closer to ocean protection: Greenpeace", Greenpeace press release, June 2, 2010. Retrieved July 28, 2010. ↑ "Loblaw buying T&T Asian food chain". Canadian Broadcasting Corporation. July 24, 2009. Retrieved December 5, 2011. ↑ Dana, Flavelle (September 13, 2011). "Loblaw gambles on luxury food line". Toronto Star. Retrieved December 1, 2011. ↑ "The Epicurean's Companion". Loblaw Companies Limited. Retrieved January 25, 2012. ↑ Gee, Marcus (November 30, 2011). "Brilliant new life for the Gardens". Globe and Mail. Toronto. Retrieved December 9, 2011. ↑ Strauss, Marikna (December 1, 2011). "Puck drops on new Loblaws store in hockey shrine". Globe and Mail. ↑ Hume, Christopher (December 9, 2011). "Shopping for architectural transformation". Toronto Star. Retrieved December 9, 2011. ↑ Hume, Christopher (November 30, 2011). "Hume: New Loblaws at Maple Leaf Gardens offers food for thoughtt". Toronto Star. Retrieved December 7, 2011. ↑ "Loblaw Companies Limited Completes Acquisition of Shoppers Drug Mart Corporation". Loblaw Corporate Site. Retrieved 28 March 2014. ↑ "Loblaw to buy Shoppers Drug Mart for $12.4B". Toronto Star. July 15, 2013. Retrieved February 18, 2015. ↑ "About Us - Board of Directors". Loblaw Companies Limited. Retrieved January 10, 2012. Wikimedia Commons has media related to Loblaw.